It’s quite possible Albert Pujols’s obituary was written a little too soon. I wrote him off; not entirely, but basically. Projection systems liked him fairly well early on; I didn’t, mainly due to injury concerns. Perhaps, that’s indicative of the leagues I play in, and their setup – OBP leagues mostly, where he hasn’t been quite as valuable lately. Either way, I didn’t want much to do with King Albert this season. I owned him in one league – an Ottoneu points league, purchased for $23 ($400 budget). I wish I had owned him in more. Pujols’ time in Los Angeles has been somewhat marred by what it took to get him there – a huge, wish it were mine amount of U.S. currency. And since arriving, he’s battled injuries, but performed pretty well offensively nonetheless, posting a wRC+ of 124 in an Angels uniform. His skills seemed to be eroding, though, most noticeably his plate discipline. His walk rate fell off as his swings outside of the zone increased, causing him to swing and miss more often. Considering the work done by Jeff Zimmermann and Eno Sarris, it wasn’t a huge surprise: Contact skills – production, too – tend to fade with time. 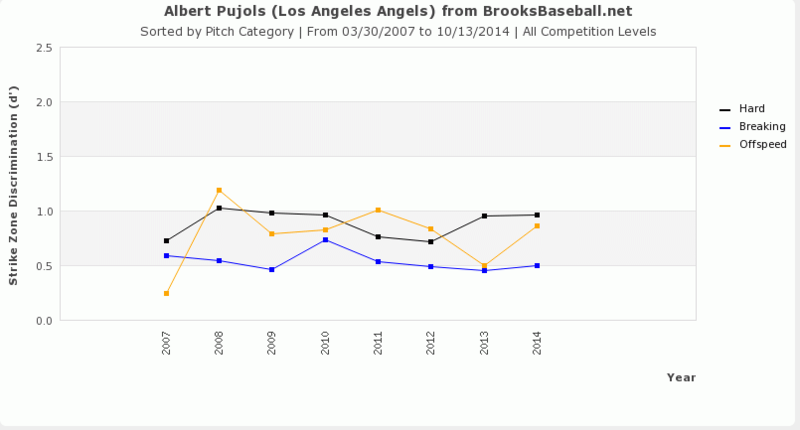 To me, at least, what made Pujols be Pujols was his contact rate. Hitting a bunch of home runs is one thing. Doing so while rarely swinging and missing is another. From 2002 through 2011, no one hit more home runs than Pujols. And of the men who hit at least 200 home runs during that span, no one posted a lower swinging strike rate than Pujols’ 5.6% mark. Finally, except for 2002 and 2003, Pujols never posted a swinging strike rate over 7% while in a Cardinals’ uniform. He posted 7% and 7.6% marks during his first two years with the Angels before cutting it back down to 6.7% this season. Pujols’ “falling off” wasn’t/isn’t like a lot of the declines we see: ones where strikeouts are out of control, plummeting production, etc. He just got older. Sure, he swung and missed more, but the second worst strikeout rate of his career was in 2013, when he whiffed in 12% of his plate appearances. Big whoop, right? Well, kind of. And it’s no coincidence that his resurgent 2014 campaign – compared to 2013, anyways – was aided by an increased contact rate. Part of the problem in 2012 and 2013 was an increase on whiffs versus breaking pitches. Over the years, Pujols’ swing rate versus breaking pitches has been pretty static, except for a huge spike in 2012, coinciding with theories that he was having to start his swing earlier to catch up with upper echelon fastballs. He swung at the same amount of breaking pitches this year; he just didn’t miss them as much. And he seemed to have picked his battles a little more effectively. He was a little more discriminatory about which breaking pitches he offers at. Perhaps it is a slight difference, but it’s there, nonetheless. Against Breaking Pitches (748 seen), he has had a poor eye (0.50 d’; 53% swing rate at pitches in the zone vs. 34% swing rate at pitches out of the zone) and a steady approach at the plate (0.16 c) with a league average likelihood to swing and miss (27% whiff/swing). His eye versus breaking pitches was still considered poor, but there was slight improvement. That counts for something, right? Paired with his well above-average likelihood of not swinging and missing a fastball, or anything else in the zone, extra contact is just gravy. I mentioned it in my rankings not too long ago but, Pujols isn’t going to be the guy he once was. Father time and what not. But when healthy, he’s still pretty darn good. Among qualified first basemen he was near the top in nearly every standard category – including steals! His average leaves a little to be desired, but honestly, he can’t run very well anymore, so he’s going to carry a low BABiP. And you’ll live with that if he keeps driving in runs and leaving the yard 25+ times. It makes sense to project Pujols’ numbers to decrease a little next season; Steamer sees that happening, but as long as he’s on the field he should be fine. At 35, it’s somewhat miraculous he’s in decline yet still extremely valuable. Hopefully he has at least one more year in him. We hoped you liked reading Albert Pujols: Fighting Father Time by Landon Jones! Any article about Pujols’ decline that doesn’t address the likelihood of his real age is flawed. His career arc makes perfect sense if you add two more years. Not sure it’s relevant. His sudden (and permanent) decline in 2011 doesn’t fit the early decline phase (if he’s 31) *or* the accelerated decline phase (if he’s 33). That sort of precipitous drop happens more frequently with old age, sure, but the sudden evaporation of talent never “makes perfect sense”, at any age. And the more gradual decline that he’s experienced since 2011? It suggests that he’s aged almost exactly as we would expect from someone between the ages of 31 and 34. He’s averaged 137 games and 2.7 WAR in the last three years; my back-of-the-envelope calculations say that the number of games is about right, and he maybe should’ve accumulated another 1.5 WAR if he’s as old as he claims, 1 WAR if he was lying. Pretty close. Agree 100% with Sam regarding the “never mention the ‘age’ thing! !”, other than I don’t see where it is all that pertinent right here. Just for next season, how much extra fall-off would you expect from a 37- rather than a 35-year-old? Not all that much extra, I’d think. His career arc also makes perfect sense if you realize that the concept of a “career arc” has wide error margins on it. That way you don’t have to make unfounded accusations about which you have exactly zero relevant evidence. You mean like Joe Posnanski has done and Rob Neyer has done and et.cet., et.cet.? An open-minded person in particular cannot read the Poz article and continue concluding (key word) that Pujols is his stated age. Other than that this has now become a ‘culture war’ issue for the cult of Sabre (‘the Goobers are questioning Pujols’ age, so we Smart People know they’re wrong!’), so pretending ‘move along, nothing to see here folks!’ gets you cult fan points, logically best to just not mention his age in any article. Oh BS. Throw out the 2013 Plantar Fasciitis which would diminish anybody’s numbers, his 2012 and 2014 numbers are much better than a computer generated “career arc” for age 34 and 36 would spit out. I’m guessing from your “name” that you’re a Cardinal fan. If so, then surely you know that he’s had plantar fasciaitis three other times earlier in his career. Its the bat speed, not the feet, that’s doing him in.